>I stumbled across Audrey Layne Combs’s work by accident. 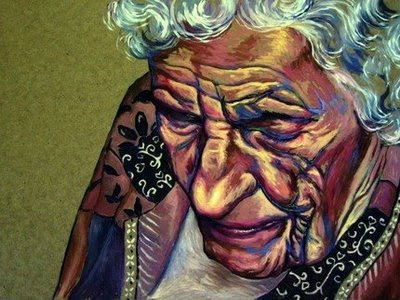 She is a multi- faceted artist who paints and draws and creates, but I was most fascinated by her ‘Beauty of Age’ series. These are people you would walk by daily, perhaps without a second glance. 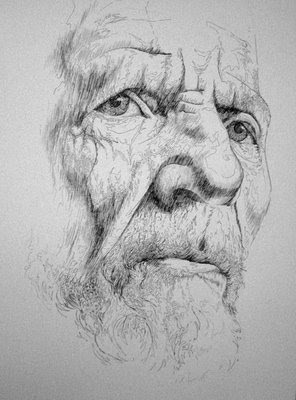 This artist has the unusual ability to show us the beauty we’re missing in these time worn faces. I especially enjoy her use of pushed color that seem to draw attention to each joyous line and fold. It’s such a beautiful positive statement about life and I’m glad I found this new member to Etsy. Thank you Audrey for agreeing to be part of my ‘Artisans to Note’ series! What medium do you work in primarily and why? I primarily work in oil in my paintings and pen and ink in my drawings. Oil paint is much more fluid than other paints, and I find it more suitable for the subject. Pen and ink is incredibly fine and precise, which allows me to get in all the detail and design in my drawings. I especially enjoy your portraiture of mature faces…can you explain the appeal of this subject for you. 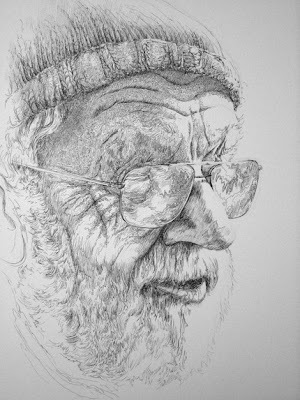 My work seeks to portray the overlooked divinity of the physical and mental transformation involved in the development of the elderly person… Whether from observation or imagination, each piece I create aspires to honor and celebrate the lives of these individuals, and communicate their beauty, dignity, worth, and wisdom. Every passion includes a nasty job. Is there a part of your work that you will delegate when you make it big? When I get big, I’ll delegate all the marketing and photographing of my work, as well as shopping for supplies. I just want to do my work- I hate fooling with all the other stuff, because it takes more time than making the work itself. What is it that you enjoy most about the process of your artwork? I enjoy the therapeutic aspect of making my work- it is an escape. My mind, usually busy and worried about any number of things, becomes clear and relaxed. What are your biggest obstacles regarding your art and what have you done to overcome them (it). The biggest obstacle of my work over the duration of my art career is finally being able to execute what has been inside my head all along. It took many tries and failures to get my work to where it is now. Another obstacle is being able to see my work as others see it, or try to look at it objectively. I still have not figured that one out. I have a bonus room above my garage that I use as my studio. My husband and I just bought our first house, and I refused to buy anything that didn’t have extra space for me to finally have a studio. 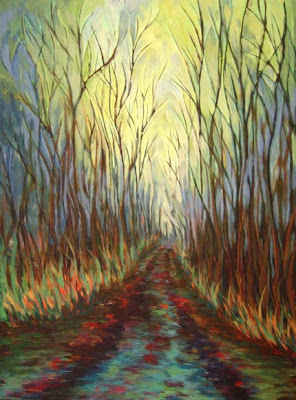 That way I can roll out of bed and go paint while I drink my coffee if I like, and there’s no need to get in the car and go anywhere. I am a full time art teacher during the day. I look forward to the time when my artwork sells enough so I don’t have to work, and can just make art all day. If you’re interested in reading past ‘Artisan to Note’ interviews with the whimsical illustrator ‘MarmeeCraft‘ or viewing the wonderful hand thrown creations of ‘Mudstuffing‘ as well as the magical metal creations from Kirsten Skiles , please click on the respective links. >What beautiful work! When I was first starting in art school, my primary focus was charcoal portraits and figural work, so these are close to my heart. Great find! >Thanks for stopping in Laurie! >Oh, very cool work you do, Audrey! Thanks for introducing us to her, Deborah! There is so much beauty in an elderly face, so much texture and graceful softness, and Audrey captures it so well. >Very impressive. Thanks for introducing her work to us. « >Please send me your links..
You are currently reading >Artisans to Note- Audrey Layne Combs at fireandglass.